Set of 6 mountain adventure graphics product pack. 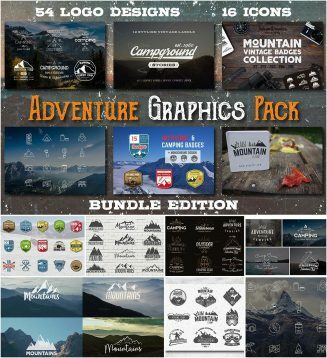 Enjoy a collection of hiking typography badges, mountaneering labels, winter sports (ski, snowboard) logo design, travel line icons, ski patrol patches and many other graphics. File format: .psd, .svg, .ai, .eps, .png for Photoshop or other software. Tags: camping, hiking, icon, mountain, sport, travel, wild, winter.